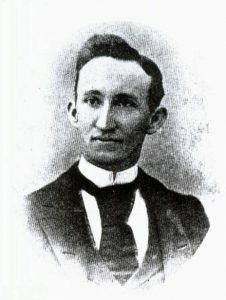 Willis Ritchie was born in Ohio in 1864. In his youth, he apprenticed with a carpenter and contractor, and later took a correspondence course suggested by the U.S. Treasury Department head architect. In 1885, as his professional career became more established, Ritchie moved to Kansas. There he practiced architecture during a time of growth, fulfilling commissions for a banks, college buildings, schools, hotels, a courthouse, and post office buildings. Ritchie moved to Seattle in 1889, then relocated to Spokane in 1892. Once out west, a majority of Ritchie’s commissions were for institutional or government buildings, fulfilling needs all over the Pacific Northwest. These included buildings such as the King County Courthouse of Seattle, the Jefferson County Courthouse of Port Townsend, as well as the courthouse for Whatcom, Thurston, and Clark Counties. In Spokane, where he spent a majority of his career, Ritchie designed the Spokane County Courthouse. Ritchie’s design for the courthouse was selected in an architectural competition in 1893, with a prize of taking home five percent of the projects construction costs, while also beating out Kirtland Cutter who took second place. The building was among the rising popularity of the Renaissance Revival Style, influenced by the Ecole Des Beaux Arts in Paris, a trend that took off after the Chicago’s World Fair of the same year. It is believed that the design of the courthouse was influenced by two 16th Century Renaissance Chateaus: Chateau de Chambord and Chateau d’Azay le Rideau, both of which are found along the Loire River in the heart of France. The brink used for the courthouse was dry-press brick developed by the Washington Brick and Lime Company, some of the first brick of its kind used in the Inland Northwest region. The building is perhaps Ritchie’s most significant architectural design in Spokane, as it exemplifies both ingenuity along side supreme execution of the French Renaissance style. The structure’s original design remains strongly intact to the present day, while still serving as the courthouse for Spokane County. Another prominent structure of Ritchie was the City Hall Building, which was demolished in 1910 to allow for the Union Pacific Railroad to build track and their station in the Downtown Spokane. Later in his career, Ritchie build houses in Spokane, such as the Comstock-Shadle House and the Shadle-Hughes House. While Ritchie did not provide Spokane with the vast quantity of buildings in Spokane compared to some of his fellow architects in the early 20th Century, his bold designs were ahead of his time in the Pacific Northwest and can be found still in use throughout the region. Durham, N. W. History of the City of Spokane and Spokane County Washington From Its Earliest Settlement to Present Time, Volume 3. Chicago: The S. J. Clarke Publishing Company, 1912. 122.